Dorsal lacrimal glands of 10 camels free of apparent ocular disease were examined to compare the normal anatomical properties of these. All of glands were characterized and measured (length and width) in left and right side. The lacrimal gland in camel was elongated and irregular in outline. The gland located in extends caudally beyond the caudal border of the zygomatic process of frontal bone and was surrounded by periorbital tissue and the periosteum on the inner surface of the supraorbital portion of the frontal bone. The gland was compressed between the bone and the bulb of eye. Dorsal surface of gland was convex and contacted with orbit. The ventral surface was concave that located on bulb of eye. Medial border of gland was wider than lateral in two side. The mean length of dorsal lacrimal gland was 53.7±2.58 and 49.4±2.63 mm in left and right side, respectively in mediolateral direction. The mean wide of it was 20.1±1.37 and 18.2±1.2 mm in left and right side, respectively in anterior-posterior dimension. There was significant difference between length of left and right dorsal lacrimal glands. The mean length of the left dorsal lacrimal gland was greater than the right and difference was significant (p<0.05). Lacrimal glands are responsible for the production of tear fluid that helps maintain corneal health. Major secretory source for proteins and electrolytes found in normal tears. The functions of this dilute protein solution are to optimize the optics of the cornea, to lubricate and to protect the eye from pathogen. Tear film made of trilaminar structures 7 μm thick which consists of lipid produced by the meibomian(tarsal) glands; aqueous, produced by the lacrimal and nictitans glands and mucin, which is produced by the conjunctival goblet cells. In most species, the majority of tears are secreted from the dorsal lacrimal gland (Carrington et al., 1987; Nguyen et al., 2006). Examination of lacrimal glands of human beings, dogs, cats, horses, pigs, rabbits, sheep, goats and guinea pigshas been described by Sinha and Calhoun (1966), Allen et al. 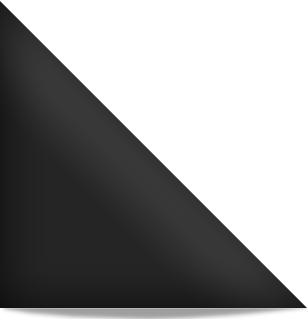 (1972), Krochmalska (1976), Gillette et al. (1980), Martin et al. (1988) and Gargiulo et al. (2000). However, in literature, the dorsal lacrimal gland of camel did not compare between two sides. The objective of this study is to determine of morphology of dorsal lacrimal gland in one humped camel and to compare it in two sides. In this study, twenty lacrimal glands (ten right and ten left) from ten camels were used during April of 2008. The glands were removed immediately after slaughter from apparently healthy adult animals. The samples were collected from slaughter house, Mashhad, Iran. The gland was first exposed by careful dissection of the skin and the periorbita at the dorsolateral part of the eyeball and then removed. Topography of left and right dorsal lacrimal gland with relation to other structures were studied and then length and width to the nearest millimeter were recorded for each gland in two sides. The data between left and right lacrimal glands were statistically analyzed and compared using student`s t-tests. The dorsal lacrimal gland of one humped camel was similar other ruminant in appearance with the exception of an accessory lobe in cattle (Pinard et al., 2003). It was flattened and elongated with indented borders. It was irregular in shape and surrounded by periorbital tissue and the periosteum on the inner surface of the supraorbital portion of the frontal bone (Fig. 1). Dorsal surface of gland was convex and contacted with orbit. The ventral surface was concave that located on bulb of eye. 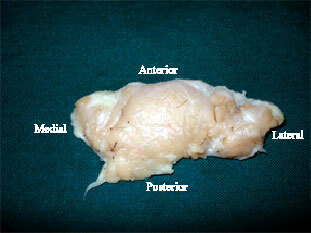 Medial border of gland was wider than lateral in two sides (Fig. 2, 3). The bovine dorsal lacrimal gland is 60-70 mm in length and 35 mm in width (Constantinescu, 2004; Getty, 1975), which is considerably larger than the gland of the camel. In present study it was 49-53 mm in length and 19 mm in width. This has already been commented in previous studies that the lacrimal gland of the camel is less well-developed than that of either the ox or horse. Thus the statement by Getty (1975) that the size of the lacrimal gland is related to animal size may not be universally true. Morphology of dorsal lacrimal gland had been studied in ovine. The dorsal lacrimal gland in sheep and goat is flattened and oval in shape; it has a pink color and is surrounded by periorbital tissue and the periosteum on the inner surface of the supraorbital portion of the frontal bone. The gland is situated to a great extent under the frontal bone and overlaps the rectus dorsalis muscle. The gland may be partially hidden by fat that surrounds the bulb. The greatest dimension of the lacrimal gland was reported 28 mm in a mediolateral direction. 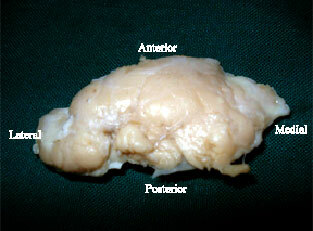 The anterior-posterior dimension of the gland was reported about 20 mm (Constantinescu, 2004; Getty, 1975). We concluded that, in one humped camel; dorsal lacrimal gland is smaller than bovine. In present study mean length and width of left dorsal lacrimal gland was greater than right and difference was significant (p<0.05). However, dimension of each organ in left and right side can be variable. For example, size of many organ such as: left and right kidney; left and right ovary; left and right adrenal and etc., in some animals are not same. Results of the present study, is same other structures in left and right sides and confirm the previous studies. Therefore, the main function of the lacrimal fluid in the camel is confined to the washing and moistening of the anterior part of the eyeball. This is an important function to an animal like the camel which inhabits dry, hot and sandy land with numerous sand storms. The author wishes to express his appreciation to the Research Council of the Ferdowsi University of Mashhad for the financial support (Project No. 46398). I also wish to thank Mr. Pouradybi for his assistance. Allen, M., P. Wright and L. Reid, 1972. The human lacrimal gland. A histochemical and organ culture study of the secretory cells. Arch. Ophthalmol., 88: 493-497. Carrington, S.D., P.G.C. Bedford, J.P. Guillon and E.G. Woodward, 1987. Polarised light biomicroscopic observations on the pre-corneal tear film III. The normal tear film of the cat. J. Small Anim. Pract., 28: 821-826. Constantinescu, G.M., 2004. Veterinary Anatomy of Domestic Animals, Textbook and Color Atlas. 1st Edn., Schattauer Company, Stuttgart, Germany, ISBN: 3-7945-2101-3. Gargiulo, A.M., C. Dall'Aglio, P. Coliolo, P. Ceccarelli and V. Pedini, 2000. Complex carbohydrate histochemistry and ultracytochemistry of the sheep lacrimal gland. Anat. Histol. Embryol., 29: 19-24. Getty, R., 1975. Sisson and Grossman's the Anatomy of the Domestic Animals. 5th Edn., Vol. 1, W.B. Saunders Company, New York, ISBN: 0-7216-4102-4, pp: 1024-1063. Gillette, T.E., M.R. Allansmith, J.V. Greiner and M. Janusz, 1980. Histologic and immunohistologic comparison of main and accessory lacrimal tissue. Am. J. Ophthalmol., 89: 724-730. Krochmalska, L., 1976. 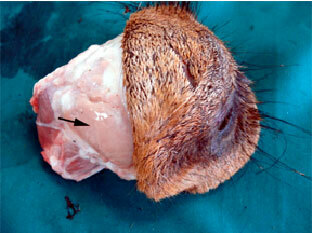 Histological and histochemical picture of the lacrimal gland in guinea pig. Acta Therio., 21: 31-36. Martin, C.L., J. Munnell and R. Kaswan, 1988. Normal ultrastructure and histochemical characteristics of canine lacrimal glands. Am. J. Vet. Res., 49: 1566-1572. Nguyen, D.H., R.W. Beuerman, M. Meneray and H. Toshida, 2006. Sensory denervation modulateseIF-2 Alpha kinase expression in the rabbit lacrimal gland. Curr. Eye Res., 31: 287-295. Pinard, C.L., M.L. Weiss, A.H. Brightman, B.W. Fenwick and H.J. Davidson, 2003. Normal anatomical and histochemical of the lacrimal glands in the american bison and cattle. Anat. Histol. Embryol., 32: 257-262. Sinha, R.D. and M.L. Calhoun, 1966. A gross, histologic and histochemical study of the lacrimal apparatus of sheep and goats. Am. J. Vet. Res., 27: 1633-1640.